Julius and Ethel Rosenberg were a couple accused in 1950 by the United States government of operating a Soviet spy network and giving the Soviet Union plans for the atomic bomb. During a time of tense scrutiny over alleged communist infiltration of the American government, the trial of the Rosenbergs became the center of a political storm over communist influence in America. Their trial was one of the most controversial of the twentieth century, ending with their execution. Julius Rosenberg was a committed communist who had graduated from the City College of New York in 1939 with a degree in electrical engineering. He married Ethel Greenglass in the summer of that year. She was a headstrong woman, active in organizing labor groups. Julius had opened a mechanic shop with his brother-in-law, but the business soon began to fail, largely due to lack of attention by Julius, who invested his time spying for the Soviets. He began by stealing manuals for radar tubes and proximity fuses, and by the late 1940s, had two apartments set up as microfilm laboratories. The arrest of the Rosenbergs was set in motion when the FBI arrested Klaus Fuchs, a British scientist who gave atomic secrets to the Soviets while working on the Manhattan Project. Fuchs's arrest and confession led to the arrest of Harry Gold, a courier for Soviet spies. Gold in turn led investigators to David Greenglass, a minor spy who confessed quickly. Greenglass then accused his sister Ethel and brother-in-law Julius of controlling his activities. Julius immediately realized the implications of Harry Gold's arrest and began to make arrangements to get out of the country, but the FBI moved swiftly. Julius Rosenberg was arrested in July 1950. Ethel Rosenberg was later arrested in August. Although Federal investigators had little evidence against her, they hoped to use the threat of prosecuting her as a lever to persuade Julius to confess. The plan failed, and the couple was charged with conspiracy to commit espionage. Their trial began on March 6, 1951. From the beginning, the trial attracted national attention. The prosecution decided to keep the scope of the trial as narrow as possible, with establishing the Rosenbergs' guilt the main target, and exposing their spy ring a lesser concern. Nonetheless, the trial was punctuated by numerous arrests of spies associated with the Rosenbergs, some appearing in court to testify against them. Ethel Rosenberg and her husband Julius are separated by a wire screen as they ride to separate jails in New York City in 1951 after their conviction for delivering secrets, including vital atomic bomb data, to the Soviet Union. The defense tried to downplay the importance of the information the prosecution claimed the Rosenbergs had stolen, but then turned around and requested that all spectators and reporters be barred from the courtroom when the information was discussed. The Rosenbergs accused David Greenglass of turning on them because of their failed business, but these efforts only elicited sympathy for a man who had been forced to turn in a family member. Greenglass damaged the Rosenbergs by testifying that Julius had arranged for him to give Harry Gold the design of the atomic bomb used on Nagasaki (which differed considerably from the Hiroshima bomb). When Gold himself testified, he named Anatoli Yakovlev as his contact. This directly tied the Rosenbergs to a known Soviet agent. 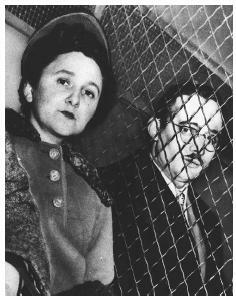 Julius and Ethel Rosenberg were found guilty on several accounts of espionage and conspiracy. They were sentenced to execution, a sentence usually reserved for cases of treason. After months in prison, the Rosenbergs still maintained their innocence and began to write poignant letters, which were widely published, protesting their treatment. The case was followed closely in Europe, where many felt the Rosenbergs were being persecuted because they were Jewish (though Judge Kaufman was also Jewish). A movement began to protest the "injustice" of the Rosenberg trial. Passions both for and against the Rosenbergs grew so great that they even threatened Franco-American relations, as the French were particularly harsh in their condemnation of the trial as a sham. In the months between the sentencing and execution, criticism of the trial grew more strident, and major demonstrations were held. Nobel-prize winner Jean-Paul Sartre called the case "a legal lynching which smears with blood a whole nation." In spite of attempts at appeal and a temporary stay issued by Supreme Court Justice William O. Douglas, Julius and Ethel Rosenberg were executed on June 19, 1953, both refusing to confess. Years after the event, the case continues to stir debate. Although the Rosenbergs were communists and engaged in espionage, they did not spy for an enemy of the United States, as the sentence might indicate, but rather for its wartime ally. Recent studies of the couple's activities show that the evidence against them was over-whelming. The declassification and release of Venona transcripts (a secret, decades-long, general surveillance operation) further implicated the Rosenbergs. Regardless of the evidence, the political and social upheaval surrounding the trial, and its ultimate outcome, can only be understood through the lens of heightened Cold War tensions and anti-Communist hysteria.